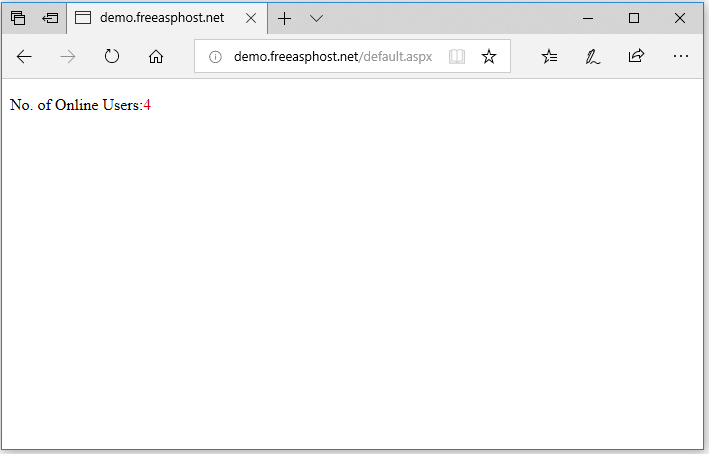 Greetings, and welcome back to FreeASPHosting.net training with ASP.NET. In this exercise, we will go through the steps of creating an Online Users Counter, which will display the total number of users on your website. 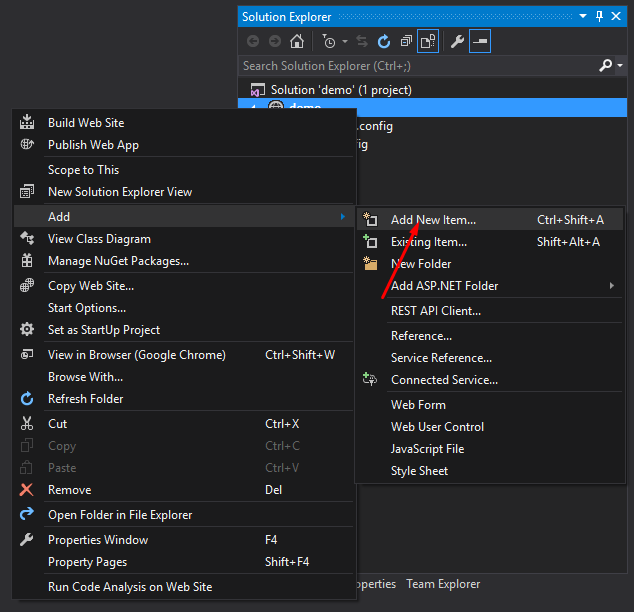 Go to File -> New -> Website then select ASP.NET Empty Web Site. 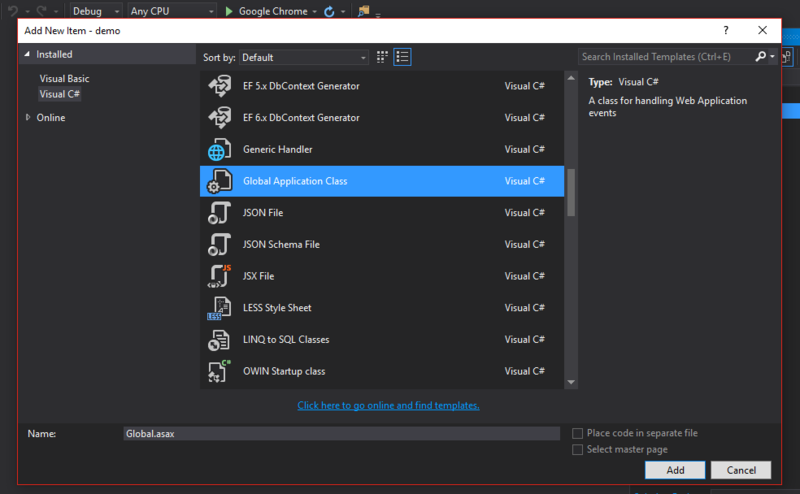 From the Items list, scroll down to “Global Application Class”, select it and leave the default name to “Global.aspx”. Press the “Add” button to proceed. Application_Start, for instance, and as it’s name explicitly say, is called when the application starts. The Session_Start event however, is called each time a new session is initiated, or in other words, a new user opens the application. As you may have guessed already, the Session_End event will trigger when a user leaves / ends the application. Simple enough! We will now put into practice what we have just learned. First, let’s use the Application_Start event to initialize an Application state variable. Let’s call it “TotalOnlineUsers”. We will be using it to hold the number of online users on our website. On the Session_Start event, let’s add the code that will increment the number of online users, each time a new session is started. On the Session_End event, we will handle users that leave the application, and thus we need to remove them from the Online Users counter. As you have noticed, in our Global.aspx file, we use sessions to count the number of online users. This being said, we need to add session’s setup in our application. Editing the web.config file easily does this. Add a webform to the page, then drag and drop a Label control from the Toolbox. Make sure that the ID of the label is “Label1”, since it will be used in the backend code to override it’s content. As you can see, and just like the Global.aspx page, we have used an Event to handle the page loading, in this case: Page_Load. So in this case, each time the page is loading, we will update the content of the counter label, and display the current number of online users. Page_Init: During this event, you can initialize values or connect any event handlers that you may have. Page_Load: During this event, you can perform a series of actions to either create your ASP.NET page for the first time or respond to client-side events that result from a post. The page and control view state have been restored prior to this event. Use the IsPostBackpage property to check whether this is the first time that the page is being processed. If it is the first time, perform data binding. Also, read and update control properties. Page_DataBind: The DataBind event is raised when the DataBind method is called at the page level. If you call DataBind on individual controls, it only fires the DataBind event of the controls beneath it. Page_PreRender: The PreRender event is fired just before the view state is saved and the controls are rendered. You can use this event to perform any last minute operations on your controls. Page_Unload: After a page has finished rendering, the Page_Unload event fires. This event is a good place to perform final cleanup work. 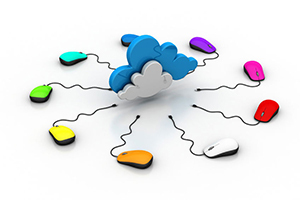 This includes items such as the cleanup of open database connections, discarding objects, or closing those files that are open. Now it’s time to run the application. You can do so by clicking on (CTLR+F5). By default, the code will display 1 as the total number of users. In order to test this, you can copy the app URL (http://demo.freeasphost.net/default.aspx) and open a different browser (or open a private navigation window) and paste the same URL in it. This will simulate a new session and you will be able to see the number of users rising. When a user visits your website, a new sessions is started and the Application[“TotalOnlineUsers”] variable is incremented by 1. When the User’s session expires, the same variable is decremented by 1. It is also possible to use cookieless sessions, by setting the cookieless property, on the web.config file to true. This will tell the application to avoid using cookies to store session IDs. Instead, these session IDs will be transferred through the URL. If you try it out on your application, each time you will open the app on a different browser, you will notice that the session ID is different.